the lack of seismic evidence for, and several contraindications of, a vertically extensive plume-like structure beneath Yellowstone and a trailing plume head beneath the eastern Snake River Plain (ESRP). The high helium-isotope ratios observed at Yellowstone and other hot spots are commonly assumed to arise from the lower mantle, but upper-mantle processes, which are consistent with the seismic results, can explain the observations. The available evidence suggests an upper-mantle origin for the Yellowstone system, extending no deeper than about 200 km. Processes involved in forming the Yellowstone-ESRP system may include local, upper-mantle convection at the discontinuity where the thin lithosphere of the Basin & Range province meets the thick lithosphere of the Archean craton to the north. The paired migration of the Yellowstone and Newberry melt anomalies may be related to the progressive migration of Basin-Range extension to the east and west, with the Newberry melt anomaly forming in the backarc environment of the Cascadia subduction system (Christiansen, 2003). Yellowstone is the type example of a continental hotspot [Morgan, 1971]. It is associated with a time-progressive trail of silicic volcanism along the ESRP that is approximately parallel to other hotspot trails in a fixed-hotspot reference frame. It is also associated with maximum 3He/4He ratios up to 16 Ra, where Ra is the atmospheric value. This characteristic is often taken to be an unambiguous indicator of lower-mantle affinity. Nevertheless, many factors such as the regional history and setting of the volcanism fit this model poorly and ad hoc adjustments of the plume model have been invoked in order to adapt it to explain the observations. These adjustments include the migration of the Cascades subduction system over the hypothesised plume, and the temporary shutting off or deflection of plume flow from its vertical ascent path to produce the Columbia River basaltic volcanism, followed by subsequent return to vertical flow as it propagated along the ESRP. The persistent basaltic volcanism along the ESRP for hundreds of kilometres from Yellowstone. The beginning of ESRP volcanism simultaneously with a major tectonic reorganization to regionally distributed basin-range extension, and fundamentally basaltic volcanism throughout much of a region 2,000 km wide. The Yellowstone-ESRP system is paired with the Newberry system, which propagated northwest at the same time and rate as northeast propagation of the ESRP-Yellowstone system (Figure 2). The Yellowstone-ESRP system marks the boundary between a rapidly extending basin-range region to the south and a region to the north where extension has been much less. In the deep-mantle plume model, this location is a coincidence. The Yellowstone-ESRP axis coincides with a major regional Precambrian structural trend. There is no evidence from petrology for elevated asthenosphere temperature beneath the region compared with other volcanic areas in western North America. Heat flow data are ambiguous, because any deep thermal signal is obscured by groundwater circulation, but heat flow is not higher than in neighbouring volcanically active places in the Basin & Range province. There is no evidence for thicker crust beneath Yellowstone and the ESRP compared with the regional, which argues against a model involving the delivery of additional melt to the area. Tomography reveals a low-wave-speed body beneath Yellowstone that does not extend deeper than ~ 200 km (Figure 3) [Christiansen et al., 2002]. At these depths, bodies greater than ~ 70 km in size horizontally, with anomalies stronger than ~ –1%, can be resolved. Beneath the ESRP a similar structure is detected, that is flanked by high-wave-speed bodies up to 200 km wide to the northwest and southeast. This is not what is predicted if the ESRP and flanking topographic swell represent a trailing plume head [Humphreys et al., 2000]. Figure 3: Cross section through a teleseismic tomography model of Yellowstone [from Christiansen et al., 2002]. Figure 4: Vertical cross-section showing receiver functions (mapped from the time domain to depth) computed for seismograms recorded on a northwest-southeast profile across the eastern Snake River Plain in southeastern Idaho, near the Yellowstone hot spot. Colors indicate zones of rapid increase (red) and decrease (blue) of wave speed with depth. Black horizontal lines: nominal depths of the 410- and 660-km discontinuities. Figure from the website of Ken Dueker, University of Wyoming. A thermal anomaly in the 410–660 km depth range would be expected to be accompanied by depression of the 410-km discontinuity and elevation of the 660-km discontinuity (see Transition zone page). However, receiver function results show that this does not occur (Figure 4) [Dueker & Sheehan, 1997]. Whole-mantle tomography shows that Yellowstone lies at a profound lithospheric structural discontinuity where the Basin-& Range region to the southwest abuts the North American craton to the northeast. There is no significant low-wave-speed anomaly either in the lower mantle or the lower part of the upper mantle. 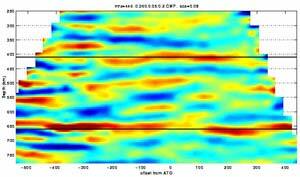 In fact, wave-speeds are anomalously high in the lower half of the upper mantle. 3He/4He values at Yellowstone range from < 3 Ra outside the caldera to 16 Ra inside the caldera. Values higher than 8 Ra are commonly assumed to indicate a component from the lower mantle since they are attributed to an excess of 3He, a primordial isotope that is thought to be largely degassed from the convecting upper mantle. However, high 3He/4He may also result from relatively low 4He. Since 4He is produced by the radioactive decay of U+Th, helium gas preserved for long periods in a low-U+Th environment will not accumulate 4He over time in the same way as helium in more U+Th-rich environments [see Helium Fundamentals page]. Figure 6: Helium-isotopic ratios. Black dots are proportional in area to the maximum 3He/4He observed locally for the hydrothermal activity. The largest dot corresponds to 3He/4He=16 Ra. Solid outline shows boundary of Yellowstone National Park; dashed line shows Yellowstone caldera. CH, Crater Hills; GGB, Gibbon Geyser Basin; MV, Mud Volcano; SGB, Shoshone Geyser Basin [from Christiansen et al., 2002]. Variations in 3He/4He in terrestrial materials thus develop over time according to the rate of production of 4He in the host material [Anderson, 1998a; Anderson, 1998b; Foulger & Pearson, 2001; Meibom et al., 2003]. Olivine crystals represent one low U+Th host [Natland, 2003], and may preserve ancient, high-3He/4He in upper mantle materials. Thus, the model that high-3He/4He indicates the flow of helium from the lower mantle is at best not unique, and an upper-mantle source, consistent with the seismic observations, is possible. Figure 6: Model for the commencement of volcanism, at ~ 17 Ma, that developed into the Yellowstone-Snake River Plain system (for more details, see Christiansen & Lageson, 2003). The Yellowstone system reflects interaction between local upper-mantle convection and regional lithospheric tectonics. This scenario involves a generic link between eastward-migrating basin-range extension, asthenospheric upwelling, partial melting of lithospheric mantle, and voluminous eruption [p. 129-130, Christiansen, 2001]. The Newberry melt anomaly has propagated west as the subduction zone has retreated to the west and north. These processes, are controlled by both large-scale and local lithospheric structure (Figure 6) (Christiansen & Lageson, 2003). Local, upper-mantle convection occurs, with propagating convective rolls organized by the sense of shear across the asthenosphere. This can explain both the Yellowstone and Newberry propagating volcanism with a single upper mantle process. It incorporates interaction of the asthenosphere with the residuum created by melt release. The magmatic propagation is seen as a consequence of hot, fertile mantle subjected to shear associated with plate transport. Such propagating, melt-driven convective instabilities have been modeled in computer simulations [Schmeling, 2000]. This model would predict the existence of other, similar melt instabilities, and these are seen in northwest-orientated magmatic trends in the Great Basin such as Jemez, St. George. The relative vigor of Yellowstone magmatism may result from its tectonic setting [Humphreys et al., 2000]. 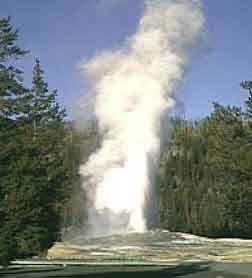 Yellowstone may represent the tip of a propagating rift that is forming as a result of more northerly motion of the lithosphere to the north than to the south. There may be some evidence for this in recent GPS surveying results. Such a model would explain the ongoing basaltic volcanism along the ESRP. Propagation along a pre-existing structural discontinuity, and the triggering of processes such as local convection, would be expected. Evidence from the Yellowstone–ESRP region strongly supports an essentially lithospheric source for this melt anomaly. However, Yellowstone is associated with a time-progressive volcanic trail and high 3He/4He ratios. This shows that such features are not diagnostic of a deep mantle plume, and suggests that they should not be assumed to be so at other locations. The upper-mantle models proposed to explain the Yellowstone system have been little tested quantitatively as a result of the widespread assumption of a plume as an a-priori model. Numerical modelling of the proposed processes, and testing against the observations at other sites of propagating volcanism, is are important tasks for the future. The Yellowstone Plume: Fact or Fiction? Christiansen, R.L., The Quaternary and Pliocene Yellowstone Plateau volcanic field of Wyoming, Idaho, and Montana, U.S. Geological Survey Professional Paper 729-G, 144 pp., 2001. Christiansen, R.L., G.R. Foulger, and J.R. Evans, Upper mantle origin of the Yellowstone hotspot, Bull. Geol. Soc. Am., 114, 1245-1256, 2002. Christiansen, R.L. and D.R. Lageson, Structural control and plate-tectonic origin of the Yellowstone melting anomaly, abstract in The Hotspot Handbook, Proceedings of Penrose Conference Plume IV: Beyond the Plume Hypothesis, Hveragerdi, Iceland, August 2003. Dueker, K.G., and A.F. Sheehan, Mantle discontinuity structure from midpoint stacks of converted P to S waves across the yellowstone hotspot track, J. geophys. Res., 102, 8313-8327, 1997. Foulger, G.R., and D.G. Pearson, Is Iceland underlain by a plume in the lower mantle? Seismology and helium isotopes, Geophys. J. Int., 145, F1-F5, 2001. Hadley, D.M., G.S. Stewart & J.E. Ebel, Yellowstone - seismic evidence for a chemical mantle plume, Science, 193, 1237-1239, 1976. Natland, J.H., Capture of mantle helium by growing olivine phenocrysts in picritic basalts from the Juan Fernandez Islands, SE Pacific, J. Pet., 44, 421-456, 2003. Schmeling, H., Partial melting and melt segregation in a convecting mantle, in Physics and chemistry of partially molten rocks, edited by N. Bagdassarov, D. Laporte, and A.B. Thompson, pp. 141-178, Kluwer Academic Publications, Dordrecht, 2000.